You are Looking to how find duplicate songs in iTunes library? Luckily, iTunes has this feature built-in. Over time, it’s easy to build up duplicate MP3s. You’ll forget that you imported the same CD a year ago, then a friend gives you a mix that has several songs you already own, and before you know it, there are dozens of duplicates in your iTunes library. You could always buy an external hard drive, but if you want to save space with the one you already have, read on. While this fix will take a few minutes of your time deciding whether the songs iTunes has found actually are duplicates, it’s well worth the time. Before we get to the duplicates, I want to cover one other area. This step is completely optional, but if you’re sorting through duplicates, you might want to make sure all of your music is in your iTunes library. By default, when you import a CD or download music from places like the iTunes Store or Amazon, iTunes will add the music to your iTunes library. But if you have received music from some other source and added it to iTunes from a folder on your hard drive, the music might still be in that folder instead of your iTunes folder. 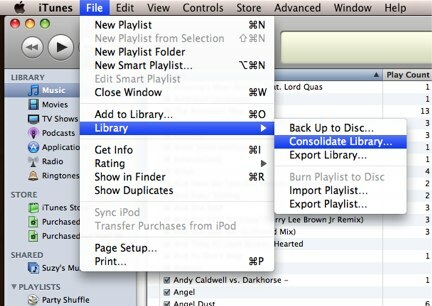 If you want to make sure all of your music is in your iTunes folder, you can consolidate your iTunes library. 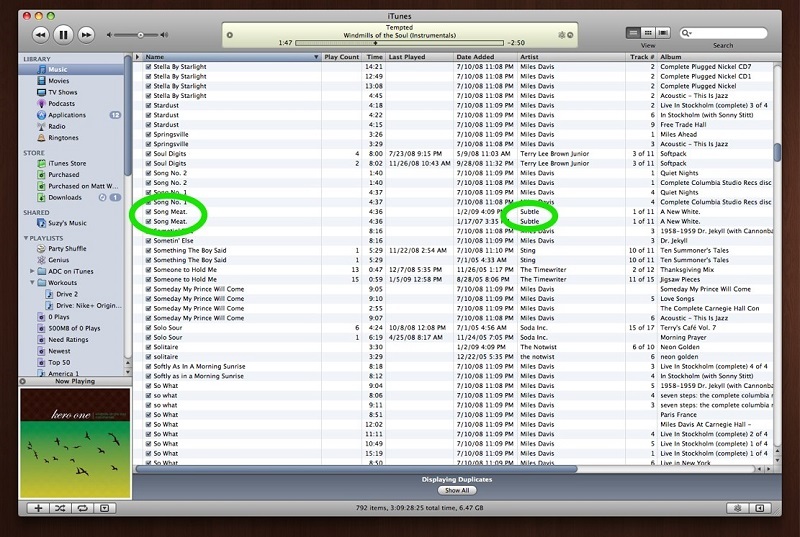 If you do this, iTunes will look at all of your music and move any music not in your iTunes folder into it. This means that if you want those files to stay where they are, don’t consolidate your library; but if you want them all in one place, this is a good option. Once you do this, iTunes will only show you the songs it believes are duplicates. How does it determine this? It looks for songs whose titles and artist names are identical or nearly identical. While this is a very good method, iTunes is assuming you have only one version of a song by each musician (meaning it doesn’t understand how to handle live albums with the same songs as are on studio albums or alternate takes of the same song). As you can see above, I’ve circled two copies of a track called “Song Meat” by the band Subtle. It appears they both come from the same album and are the same length in time, so these two are definitely duplicates. The same could be said of the Sting songs, but not of the Miles Davis renditions of “Someday My Prince Will Come,” since they all come from different albums. When you want to delete songs, simply highlight them and press the delete key. If iTunes asks you whether you want to move the songs to the Trash, you should say yes if you want them removed from your hard drive. Note: When you delete duplicates, they are moved to your trash, and when you empty the trash, the songs are gone for good. You might want to have a backup of your iTunes library before attempting this, just to make sure you don’t delete a copy of a song you want to keep! Did this tip work for you? 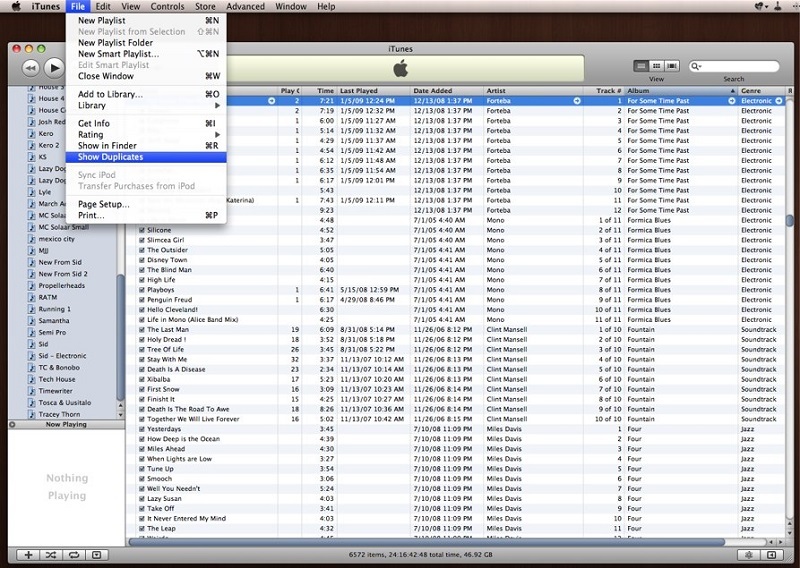 Have you found a better way to manage duplicates in your iTunes library? Let others know in the comments.